Porsche Cayennes with Audi-sourced diesel engines are suspected of having cheat software. BERLIN -- Porsche denied a report that it is using unauthorized software to cheat on emissions tests. The KBA is examining whether Porsche is using steering wheel movements to detect whether its cars are on the test bed, the magazine said on Friday. "We can confirm for all Porsche models: We are not using steering movements for the sake of detecting a test bench driving cycle and reacting to it," Porsche said by email. The KBA deferred to the transport ministry for comment, but the ministry didn't respond to requests for comment. Germany's transport ministry on Thursday had accused VW Group's Audi division of using illicit software on some A7 and A8 models with V-6 and V-8 diesel engines. The vehicles in question emit excess nitrogen oxides when the steering wheel is turned more than 15 degrees, the ministry said. 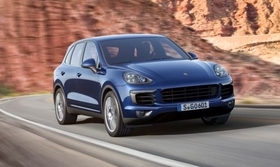 The KBA is investigating Porsche models such as the Cayenne SUV that use V-6 and V-8 diesel engines from Audi, the magazine said.